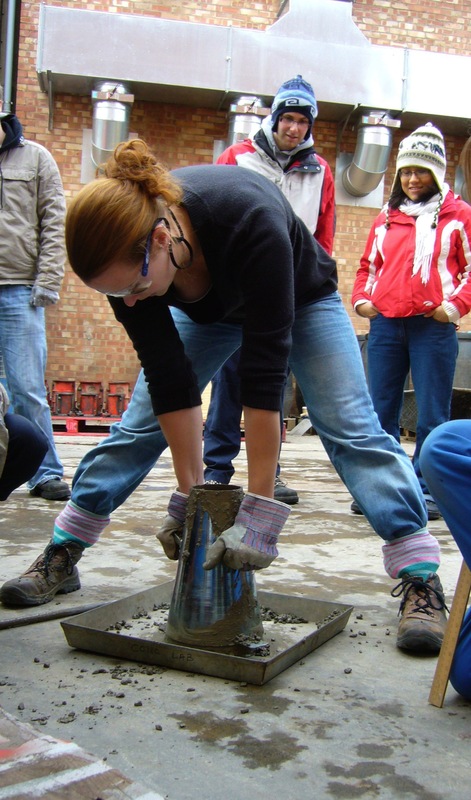 The School of Engineering offers three Undergraduate Degrees in Civil and Environmental Engineering: our flagship Civil Engineering degree, and two specialist variants, Structural and Fire Safety Engineering and Structural Engineering with Architecture, both of which are tailored to current industry needs. All three degrees are offered in both 4 year BEng and 5 year MEng variants. Within the main Civil Engineering degree, we offer flexibility to specialise in various aspects of Civil Engineering, these are formalised in three specialisation streams: Environmental Engineering, Structural Engineering, and Construction Project Management. Details of these degrees and streams are given below. In year one, you will spend about a third of your time studying Engineering principles in the courses "Engineering 1" and "Civil Engineering 1" and about a third of your time studying Mathematics, as a good grounding in maths is essential for all engineers. The remaining third of your time is reserved for optional courses; many of our students opt to study courses in the physical sciences, or other engineering disciplines, but some choose to study a diverse range of topics including history, modern languages, classics and architecture. You can choose from anything the University of Edinburgh has to offer! In the second year of your degree, we give you a strong fondation in all aspects of Civil Engineering, including Structural Mechanics, Soil Mechanics, Fluid Mechanics, Engineering Geology, Materials Science, Structural Design, Numerical Tools, Water Resources and Advanced Mathematics. A particular highlight of our second year is the week long residential Surveying Field Trip in the second semester. There are no optional courses in 2nd year, this means that the entire year group works together and there is an emphasis on group work, an essential part of Civil Engineering practice. Third year builds on the foundations laid in second year and introduces fields such as Engineering Sustainability, Infrastructure & Transport, Water & Wastewater, and Environmental Engineering. Some options are available, including Fire Safety Engineering. Fourth year offers students the chance to specilaise in one particular field of engineering, if desired, or to select a range of topics spanning all of Civil Engineering. A key feature of the fourth year programme is the focus on group design projects, both within Civil Engineering and in inter-disciplinary group projects working with mechanical, chemical and electrical engineering students. The main focus of the final year of our degree programme is a research project which takes about 50% of your time and spans the whole year. In Civil Engineering, these research projects are generally carried out by pairs of students, working together, and may include lab work, numerical modelling, analysis, design, etc. Along side the research project, students have the opportunity to study further optional courses. At the end of this, you will graduate with a highly respected and internationally recognised degree, and be well on your way to becoming a Chartered Engineer! The 4 year Civil Engineering BEng (hons) degree follows the same pattern as above for years one to three. In year four of the BEng degree, students spend about a third of their time on a research project, much like the MEng projects described above, about a third on core engineering courses and about a third on optional specialisations within civil engineering. At the end of this, you graduate with an internationally recognised degree. A detailed schematic of the BEng degree in Civil Engineering is also available here. The 5 year Structural and Fire Safety Engineering MEng (hons) degree follows the same pattern as the Civil Engineering degree up to year three, where Fire Safety Engineering is a required course, not an optional course. In years 4 and 5 SFSE students take a slightly different range of core courses from the Civil students, including the Fire Safety Engineering Design Project and the Fire Dyanmics Laboratory. 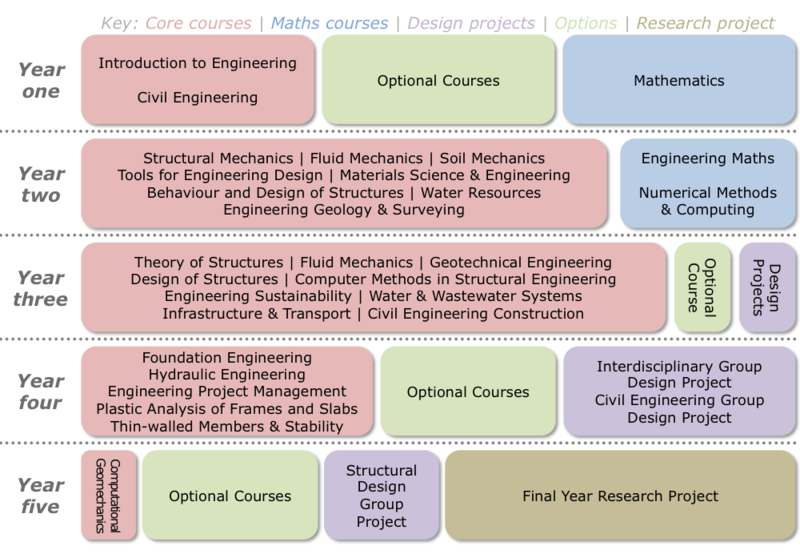 These courses are unique to the SFSE degree programme and are not offered as options to the Civil Engineers. 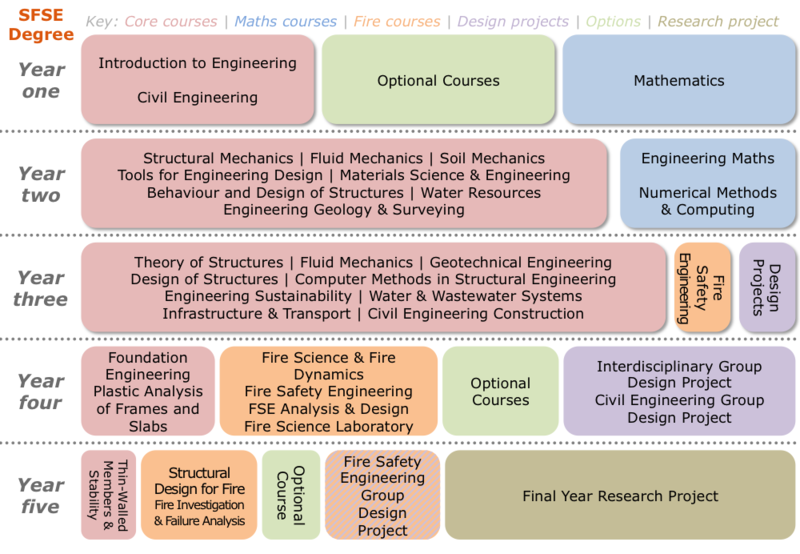 (Note: Civil Engineering students can choose various fire safety courses as options in years 3, 4 and 5). The field of Fire Safety Engineering is a relatively young Engineering discipline, and Edinburgh graduates have risen to the top positions in the disipline in many major engineering companes, all around the world. A detailed schematic of the MEng degree in Structural and Fire Safety Engineering, showing all the currently available options, is available here. A four year Structural and Fire Safety Engineering BEng (hons) degree programme is also offered. A detailed schematic of the BEng degree in Structural and Fire Safety Engineering is also available here. Due to the shared degree structure in years one to three, it is possible to switch from the Civil Engineering degree path to the SFSE degree path, or vice versa, at any point up to the end of third year. About half of your first year is spent in Architecture classes, and half in Engineering & Maths. In order to give you the basics of both disciplines in a single year, there are no optional courses in first year. The majority of classes in 2nd to 5th years are shared with the Civil Engineering students, except the SEA students omit classes in fluid dynamics and water engineering and study further architecture courses in their stead. 3rd to 5th year SEA students have the opportuity to study optional courses in Architecture or Structural Engineering, and their final year project may be in either Architecture or Engineering, or shared between the two schools. A detailed schematic of the MEng degree in Structural Engineering with Architecture, showing all the currently available options, is available here. A four year Structural Engineering with Architecture BEng (hons) degree programme is also offered. A detailed schematic of the BEng degree in Structural Engineering with Architecture is also available here. Due to the unique structure of the SEA degree programme, it is not possible to switch from Civil Engineering onto the SEA degree at any point. Similarly, it is not possible to switch from SEA onto the Civil Engineering or SFSE degrees after the end of year one.